Sand and cement rendering is normally applied to internal or external brick work, it may be less expensive than applying plasterboard, as applying plasterboard to uneven brick work can be quite problematic. Plasterboard applied to timber would be cheaper than any cement render, however applying plasterboard to brick work will involve having to glue the plasterboard to brick work, problem is when the house heats up over 26 degrees celsius the plasterboard can sweat and delaminate whereas sand and cement does not. Sand and cement or commonly referred to as cement rendering is applied to brick work that is out of plum which means it is not level. Any interior wall which has no plaster board should be cement rendered and a coat of hard plaster applied, also known as white set. Cement rendering is normally applied to a lot of the old Melbourne homes that have been around for many years. Solid plastering involves the application of sand and cement render. Cement rendering is more labour intensive and obviously more expensive to apply and requires more skill then the application of Acrylic render. What you need to weigh up is the benefits of applying Cement rendering in relation to Acrylic rendering. 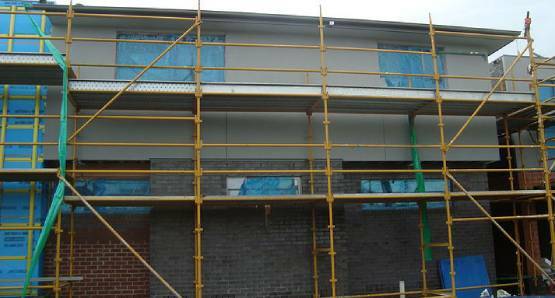 When deciding on which method to use: Acrylic render or Cement render? You need to look at the surface that you want rendered. 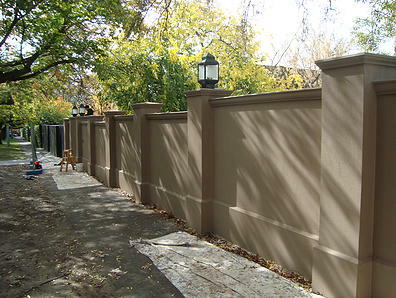 If its going to be brickwork, hopefully if the brick work is level, then you can choose between either Acrylic or Cement render, if your brick work is out of plum, you may not have a choice but to go with Cement render which can iron out the faults if completed by a professional solid plasterer. A professional solid plasterer like ours can explain the differences and the advantages or disadvantages of applying either method. What exactly have we rendered or can we render? Internally: Hard plaster white set applied to Hallways, Bedrooms, Bathrooms, Kitchens, Toilets, basically any area inside the house on double brick. Externally: Cement rendering or Acrylic rendering applied to any type of external surface such as bricks, concrete blocks, blue board and we also install polystyrene systems from 50mm to 100mm from start to finish. We also render precast panels. Specific examples, fences, letterboxes, planter boxes, retaining walls, ponds, swimming pools, single storey house rendering, double storey house rendering, business frontages, window seals to name a few.